DENV-specific CD8+ T cells are predominantly Tem and Temra cells. 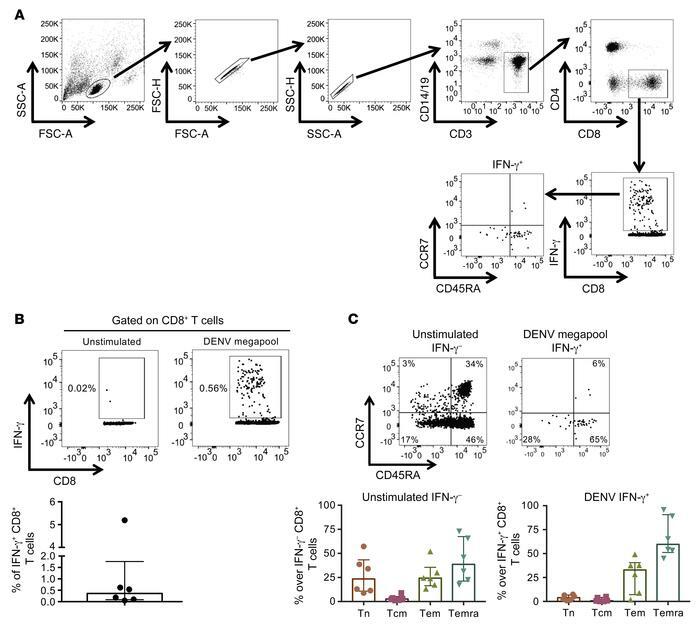 Human PBMCs isolated from donors that had been infected with DENV multiple times were stimulated with DENV CD8+ T cell megapool, and DENV-specific CD8+ T cells were identified by the production of IFN-γ. (A) Gating strategy to identify and sort DENV-specific CD8+ Tem and Temra cells. (B) Flow cytometry plots (top) and bar graph (bottom) show the production of IFN-γ by CD8+ T cells (n = 6). (C) Flow cytometry plots (top) and bar graphs (bottom) show the expression of CD45RA and CCR7 by unstimulated IFN-γ– or DENV IFN-γ+ CD8+ T cells (n = 6). Error bars show median with interquartile range.